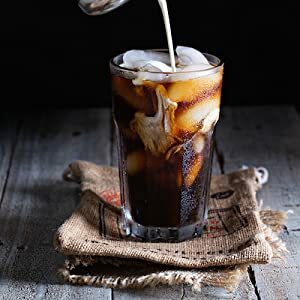 Without the bitter oils and acid finish in a sip of coffee, cold brewed coffee made in the Dutch or Japanese style… in a slow ice-drip, changes the taste to an almost caramel texture coffee experience. I recently tested a new product on the market, Dripo by gosh! and after my initial confusion in why I would want to wait 2-plus hours for a cup of cold coffee, I tasted it and get the idea….sort of. At first, the concept was lost on me. I opened the container that looked to be a carton of milk, and inside was a cylinder with three twist off parts. Fortunately, I had a guest staying with me who took charge of the initial testing. Unfortunately, the first go at making this brew took all day. I later realized that she had placed the thin coffee filter on the bottom instead of the top of the grounds, and this caused it to slow down considerably. In fact, I tried it twice and realized that its best to skip using the coffee filter on top since there is a metal filter built in. The problem for me is that i don’t really like cold coffee, and that’s what I got. Delving deeper into this phenomenon of cold-brewed coffee, I was advised to simply add a bit more coffee grind and then add boiled water so I could taste a cup of hot, yet cold-brewed coffee. The result was a caramel-smooth texture of weak coffee I really didn’t want to continue brewing in this effort-heavy method. Oh, and the cap with the pour-out lid doesn’t work. Come summertime, I will definitely make another attempt to enjoy this when the thought of drinking a cup of hot coffee is unfathomable. But for now, some like it cold, but I like my coffee hot and brewed in my traditional coffeemaker. For those who have joined the craze of cold coffee, Dripo by gosh! is sold on Amazon.com at this time for about $30, and is patent-pending. Be sure to hashtag #howyoudripo to share your smooth tales of ice-drip coffee, or visit GetDripo.com, Facebook.com/GetDripo for more information.